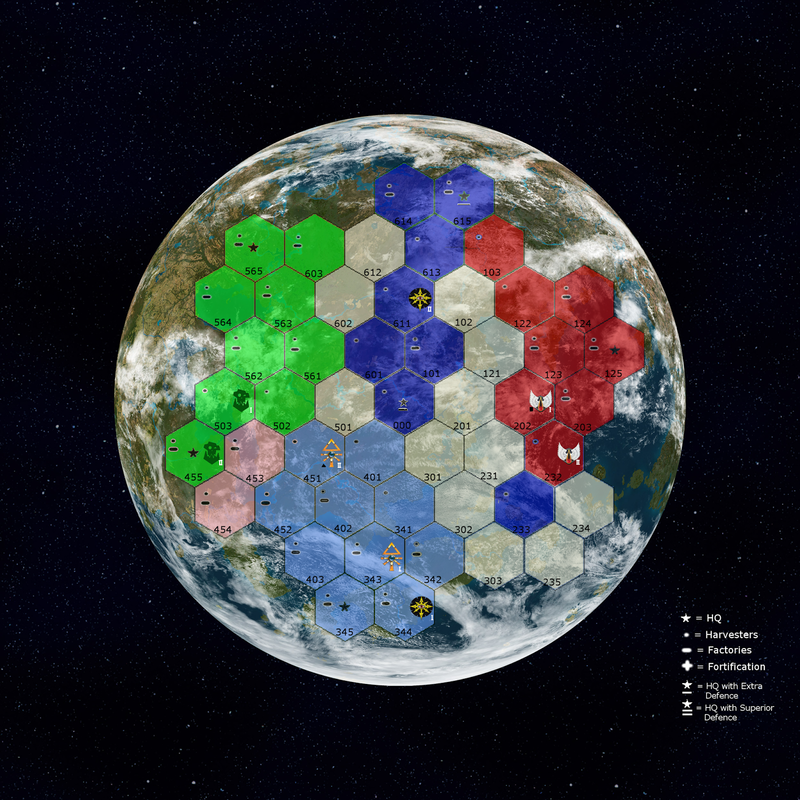 Since we're also playing Chaos Space Marines, Boons of Chaos is a thing. So we decided to make the boons possibly permanent by rolling a D6 after each battle that the character survives without being removed from play (the Chaos Gods doesn't look kindly on Champions who fail...). On a roll of 5+ the Boon becomes permanent. Boons can't stack, so if you roll the same Boon several times you're out of luck. 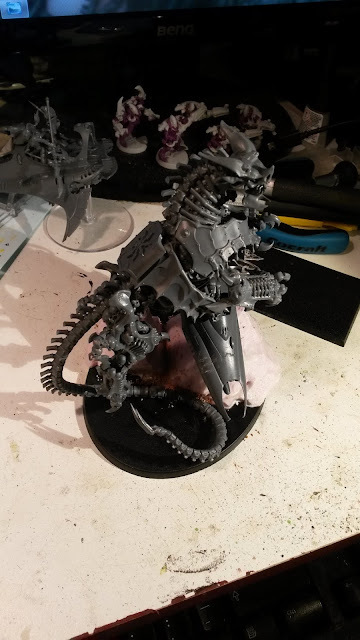 Also, as with all Chaos Lords it's a aim to become a Daemon Prince, so we added som additional rules to prevent some random Cultist from becoming a Daemon Prince before the Lord... Ignore Daemon Prince result and instead treat as D3 rewards that you automatically keep after battle (if it survives). Also, the Warlord re-rolls spawnhood (but second result stays!). And that's it for rules so far! We'll see what we end up adding as we go along! 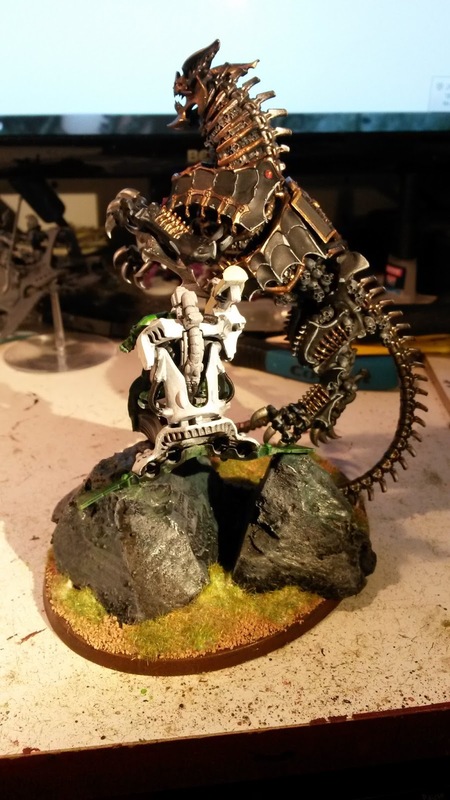 The Black Legion Chaos Sorcerer Urkadon has divined the Relic of Eternity in the Ghoul Star sector, in an abandoned ruin in the southern hemisphere of one of the outlaying planets. They say nobody returns from the Ghost Stars, but with this Relic Urkadon could unleash immense power. However, Abaddon had already charged Urkadon to oversee the Black Legion forces elsewhere so instead he sends a small strikeforce led by Nazuroth to claim the relic. And if it's true that nobody returns from the Ghost Stars, then so what? Nothing valuable is lost after all. Nazuroth however, has completely different plans. He understands well that if he can claim this relic for himself he might be granted the Boon of the Gods and ascend to Daemonhood. And who is to order him around then? The mission is basically The Relic. The winner will hold the Relic for the next mission. In the last hours before dawn Ancalion Vex ordered the company to a halt. Before them lay a massive ruined site and the darkened structure that once had been a mighty Shrine of the Aquila. 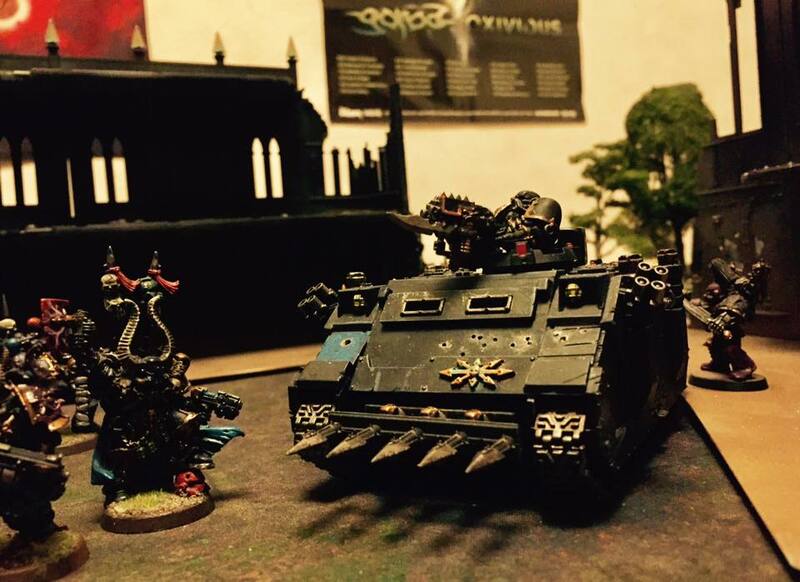 The two sellsword Obliterators Vergathrex and Forash loomed somewhere ahead in the darkness, protecting the flanks of the two Rhinos. From his leading vehicle Phoenician's wrath Vex prepared himself and his units with combat drugs to act lightning quick and enhance the senses. He sent a silent wish to She who thirsts and ordered the Rhino forward at full speed. On the Intercom the second Rhino Sound of the Tempest called out that they somehow got stuck in the heavy terrain just outside the Shrine, possibly a tanktrap that remained hidden in the dark. - Disembark and all senses alert, we're not alone here! Vex called out and ended the transmission. Ten members of the Stormshard Cult disembarked the Rhino outside the perimeter and got support from the Obliterators showing up at the broken wall on the east side of the Shrine. The Rhino crew of Sound of the Tempest sensed movement beyond the eastern wall and fired a warning shot with the Havoc Launcher. If something was hit there was no sound but the eerie echoes from falling bricks and metal further away in the shadows of the great arches of the Shrine. The Phoenician's Wrath went alone into the ruin and Ancalion sensed that the ancient device they came for was closer than he thought possible. In a shallow sarcophagus next to the vehicle something was glowing dim. Anticipation and greed filled his soul as he and his squad checked the surroundings before the disembarkment. - We're under fire! We're not alone! Nazuroth heard from the vox as he was sitting in his Rhino looking out at the darkness. - What? This world is supposed to be devoid of life. What trickery is this? Very well then, let's show them how the Black Legion greets strangers. Tagor, drop on them! Nazuroth called back over the vox. Out of the cover of darkness, over the western walls five Raptors appeared all of a sudden – with all guns blazing. Ancalion cursed that he had not been more careful in his approach towards the relic. A heavy thud against the hull indicated that a melta gun had struck home, but somehow the shot failed to penetrate the Rhino's side armour. Vex turned the hatch open and started to disembark. - Move out, and make it quick. Lazarus, you take the lead! Ancalion barked to his closest Noise champion. Then, from out of the shadows a Rhino approached like some giant creature. The lance beam from another melta lit up the night, causing the Phonicians Wrath to explode in a dark cloud of fire and smoke. The Noise Marines, Lazarus and Ancalion found their footing quickly out of the burning wreck due to lightning reflexes and turned to face the nearby Raptors. The Doom Sirens blared out and slew two Raptors with their distorted frequencies. 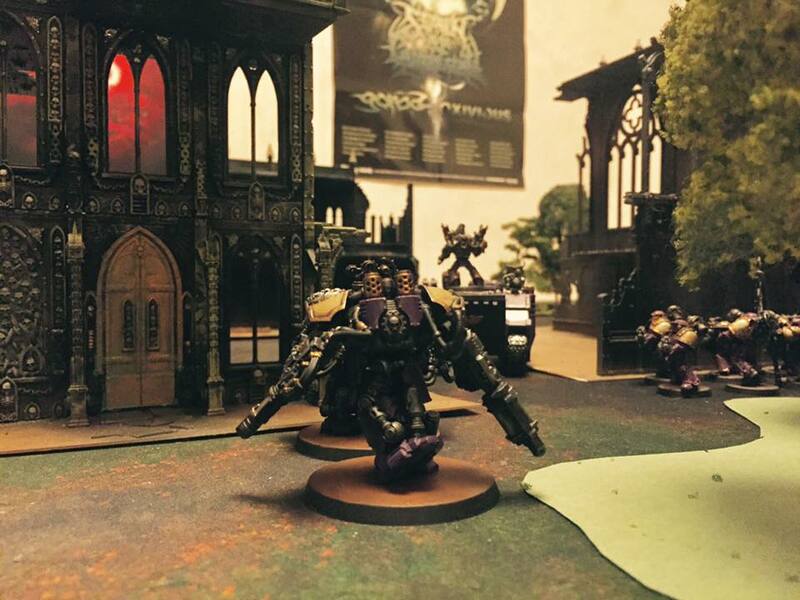 One from the Noise Marine Company fell to the fire of a boltgun pressed against helmet. The Stormshard Company eventually won the upper hand and smashed the Raptors dead. 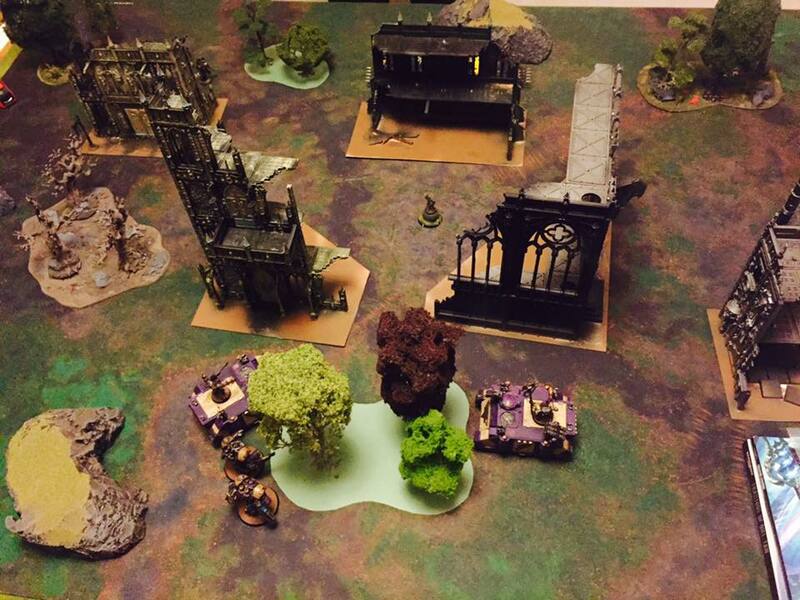 Ancalion feared incoming enemy support squads and ordered his own reserves to move in for the kill amongst the ruins. Another Rhino became visble behind the eastern wall and the Obliterators sought to bring them down with multimeltas and lascannons, although their aim was somehow obscured by the melee. 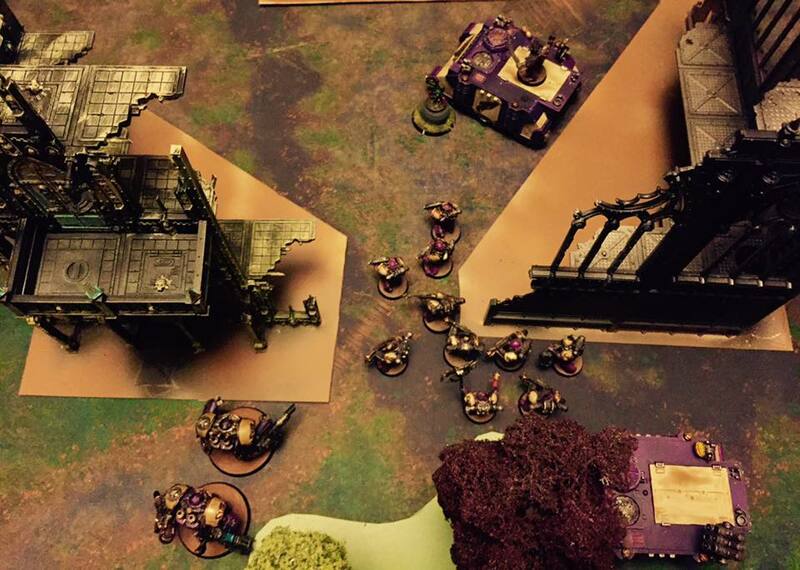 Ancalion regrouped and ordered his Noise Marines to grab the relic and fall back. Boltguns fired as the closest member of his squad got caught in a crossfire and fell during the retreat, the relic slipping from his grip. Havoc laucher missiles and boltgun rounds fell like rain among his troupe, forcing them to retreat even further towards Noise champion Levandor and his squad without being able to retrieve the item again. Strengthened by the prescence of an icon of Excess only half as many comrades fell than would otherwise be the case. Slaanesh was still with them in this dire hour. From the closest Black Legion marked Rhino climbed a unit of Chosen and feathered out like the wings of an ill omened crow. 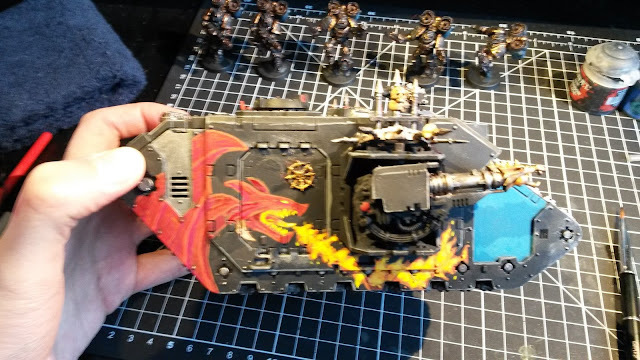 Ancalion ordered the Obliterators to take them down with their plasma cannons, but in all haste the raging blue fire scattered off and burned two Noise Marines to ashes instead. It was a weak comfort that one of the Black legion Chosen fell to the same fires. Nazuroth saw the incoming plasma fire and ordered his men to push forward. - Charge them! Show them the fury of the Gods! Ancalion started to wonder if he had been betrayed by the mercenaries, but dropped the thought, since his fighting skill was more required to survive now. There would be time for questions and vengeance later. The Noise Marines closest to the icon and Levandor spotted a second group of Raptors on the north flank and focused all their fire with support from the Rhino Sound of the Tempest and managed to bring a few down before the Raptors disappeared again on swift wings. Ancalion heavily beset from all sides saw the relic being snatched up by the unit of Black Legion Marines as a menacing looking Black Legion Lord and his retinue of Chosen closed in on Ancalion's company. Lazarus fell to the shots of another damned boltgun and Ancalion answered with the wail of his Doom Siren; slaying many, but certainly not enough before the close combat took hold. Levandor joined the fight and met the challenge of the enemy leader, his lightning reflexes served him well as he landed two swift blows that struck home. Filled with the sensation of pain the Dark Lord slew him in return, and although he got badly wounded some dark power closed his wounds as quick as they had appeared. The Black Legion command Rhino saw its chance to cause further chaos and tank shocked towards Ancalion who stepped aside with contemptous ease. Behind it, the black armoured relic thieves started to drag away their prize. Ancalion would not let them get away so easily. He saw Vergathrex fall under heavy fire, mutated limbs twisting in their final dance of death and by the first light of dawn the Raptors closed in and met Forash in a brutal assault that claimed the lives of both attacker and defender. With daylight upon the scene Ancalion realized he was all alone in this fight and though the enemy had taken heavy casualties he soon needed to find an escape plan. 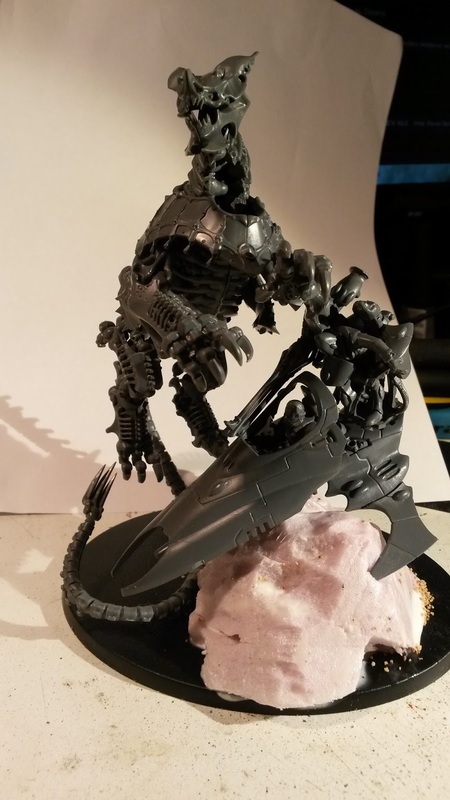 His Doom Siren Shriekwave set to the most disturbing frequencies caused the head of three Black Legion Marines to explode in a gory triplet fountain, splattering the nearby Rhino with stains of dark blood. He had lost his momentum and revealed his position, but the thieves had also dropped their cargo. The relic was still within reach of his grasp! -By Slaanesh, this prize is MINE! Ancalion swore under his heavy breath as two boltgun shots found their way through his armour. He rolled his eyes in twisted pleasure and turned to face The Black Legion Lord closing in with his gory axe held high. Some dark device made Ancalion's Doom siren to misfire when he needed it the most. He summoned all his strength and hoped that his speed would somehow buy him the time required to finish off his enemy with a few clean cuts within the blink of an eye. Sorely wounded his blows landed clumsier though than his pride would admit. The Chosen accompaning the Lord with the axe caught his arm through the flurry of blows. The opening from the parry was all his Lord needed and Ancalion soon found the monstrous axe buried in his chest.The last thing he heard was the sound of the black Rhino tanks leaving in the distance. The pain was still sweet to him when he fell into the dreamless sleep among the ruins under the light of the setting sun. Wounds: Went down in the battle. -1T for the next battle. Wounds: Went down in the battle. Fully restored. So... no characters really died, and no boons to speak of... which isn't unsurprising considering I rolled almost only the Unworthy Offering result for my Black Legion, and the one Boon I did get that wasn't turned out to be Hatred... which I already had due to being Black Legion. Ohwell! So that's it for mission 1! Stay tuned for mission 2! And thanks to V for writing his side of the story (everything in the EC colours!)! 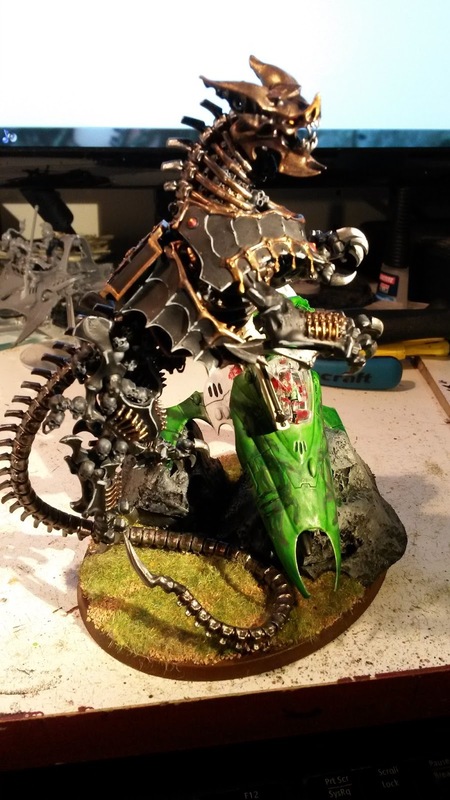 Tournament coming up, so I thought it was time to bring out the ol' Black Legion for a ride. But it needed some new paint first. I'll hopefully have a tournament report up in a couple of weeks as well! So... I've been a bit lazy in updating this blog. I'm still in the hobby though. 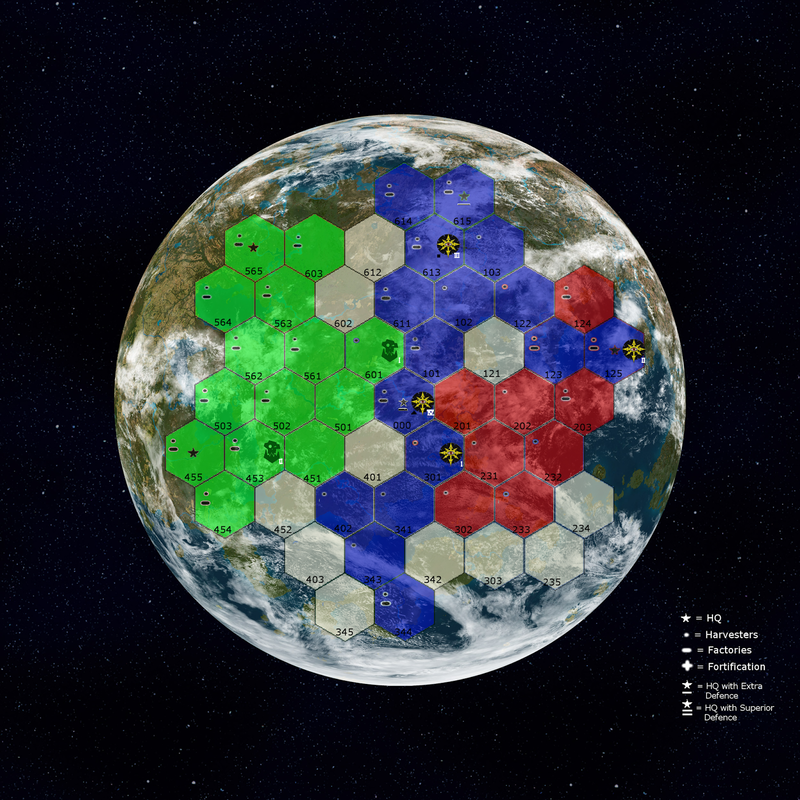 Still playing. Still making stuff. 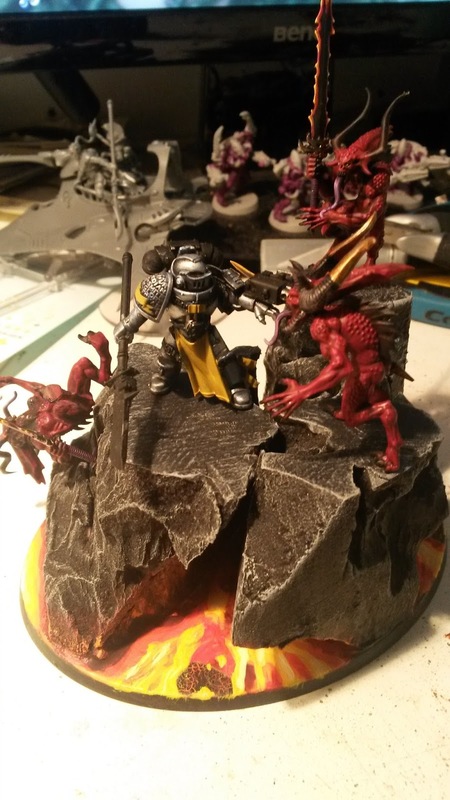 So I thought I'd share some work in progress pictures of my latest project. I'm pretty sure that when the new Chaos codex comes Maulerfiends will become a squadron or at the very least a formation. So I figured I needed another one. And also I have a little diorama that's starting to take shape (still a long way to go though) that I'll add as a bonus. So this were the orders for week 14, and the Black Legion charged the Blood Angels. It was a hard fought battle of killpoints, where my Black Legion took an early lead that the Blood Angels tried to catch up with all game. Didn't help that a 440p unit of Terminators decided to not show up until turn 4. But the Blood Angels could still have snatched a victory if it had ended by turn 5 and also killed my Warlord in the ongoing challenge. But the game didn't end on turn 5, and then my Warlord killed his instead (and was turned into a Spawn for the trouble). Nice game! So basically I've just posted a poll for the players to get back to me with feedback to see what worked and what didn't. So I'll make a full post of that later! 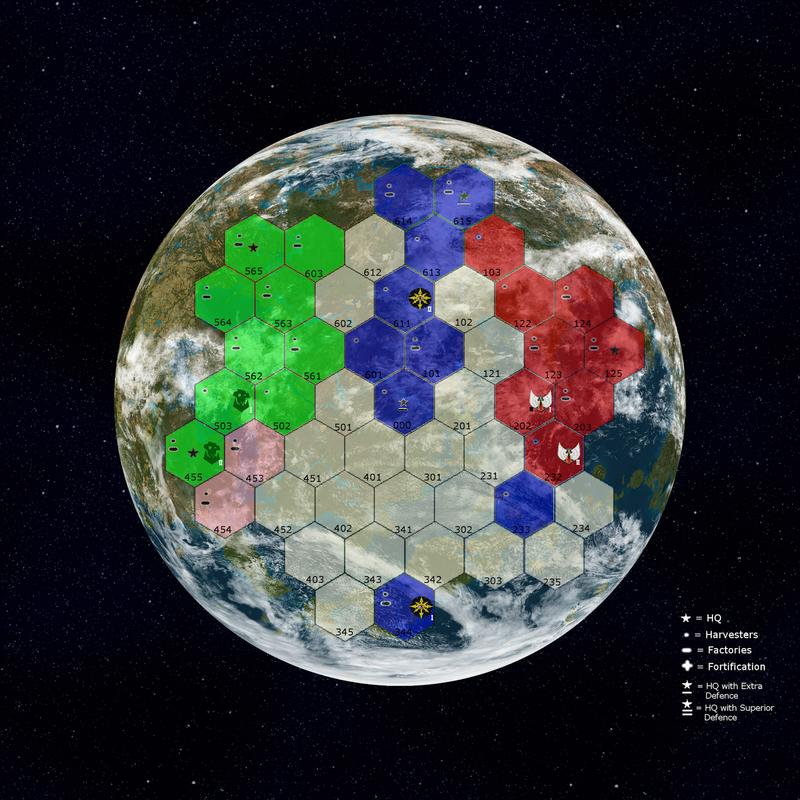 Much fun was had however, and I'll probably use the (updated) rules to run a campaign like this again, and I'd say if you get the chance you should do it as well! And we're into week 10! 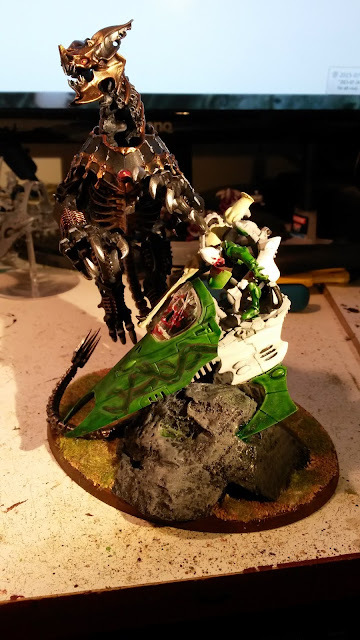 This week the Eldar decided to move a bit more defensively, and rightly so because the Chaos used their Dropships going for the Eldar HQ! Meanwhile the Blood Angels saved their Dropships and instead moved up in formation to take one of the Chaos areas. Orks also played defensively, staying back to regroup after their loss last week. So we had what looked like one fight this week! But unfortunately the Eldar player got sick and couldn't make it, and even worse has no time for the coming month or so and thus decided to leave the campaign. But such is life! So we're now half of the original players left, coming closer to the end! Allright, so interestingly enough the Eldar player dropping off made me realise we have a narrative going on here. So what has happened to far, as we're now at the half way point basically? And thus, here is the situation after week 10. The war continues!